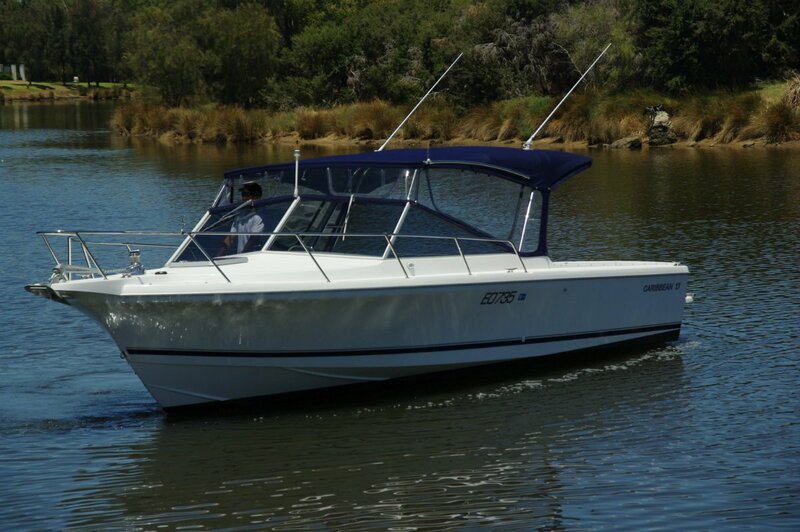 The Caribbean 27 Runabout is the sort of boat many owners of smaller sports cruisers probably wish they had bought instead, with its primary virtue of space. Going boating implies being out of doors, but getting outside on a small sports cruiser means crowding right aft with the disadvantage – beyond the crowding itself – of marring the trim. The boat may be slow to plane, and in speed restricted waters the drag will increase fuel consumption. The 27 is available as a traditional runabout with seats at the windscreen and everything aft of them just open space. Or it can be optioned up to a day cruiser – still with that precious room. 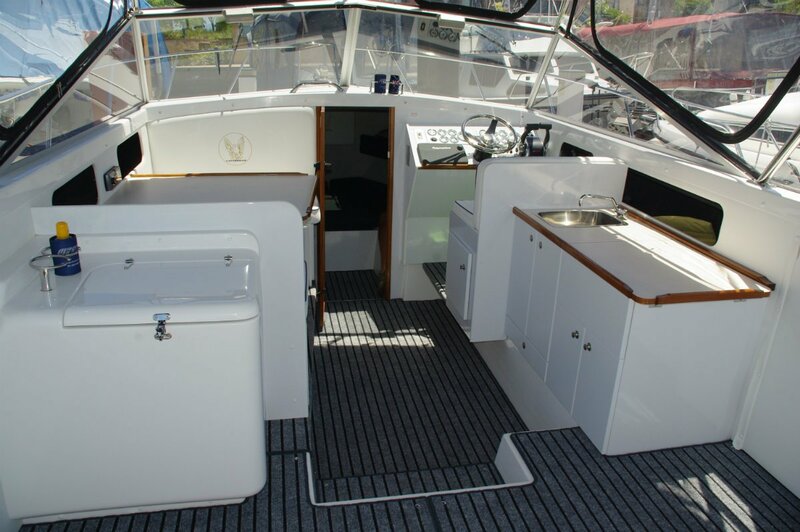 However Spartan or otherwise you choose, below the foredeck are V-berths and a flushing toilet, with the option of a holding tank if you spend a lot of time in sheltered waters. 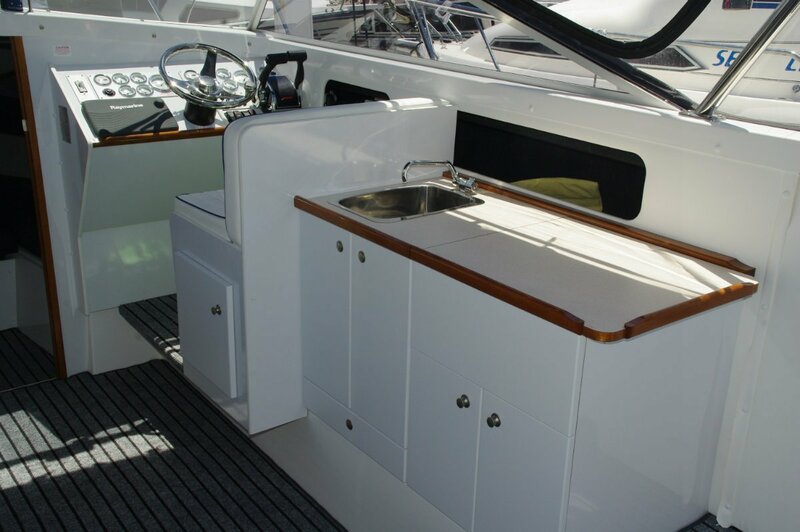 The review boat had the full fit-out, with dinette that converts to an extra bed, two-burner stove, sink and icebox. It also had a custom Targa and canopy with the add-ons to convert the whole space into an overnight cabin. The buyer of this boat had realistic views on how much overnighting is likely to actually take place, and most of the time the canvas is to protect the boat rather than the occupants. Curiously, casual galleys in the open air get used much more than elaborately fitted galleys in cruisers. Think of the vogue for outdoor kitchens and you see the reasons: no heat buildup, far more sociable, and uncomplicated cooking goes with a laid back day. For a day that includes swimming, a transom shower is laid on. The 160-litre water tank is a realistic size to cope with showers and galley use. No boat ever had too much room to put things in, but the 27 comes close. 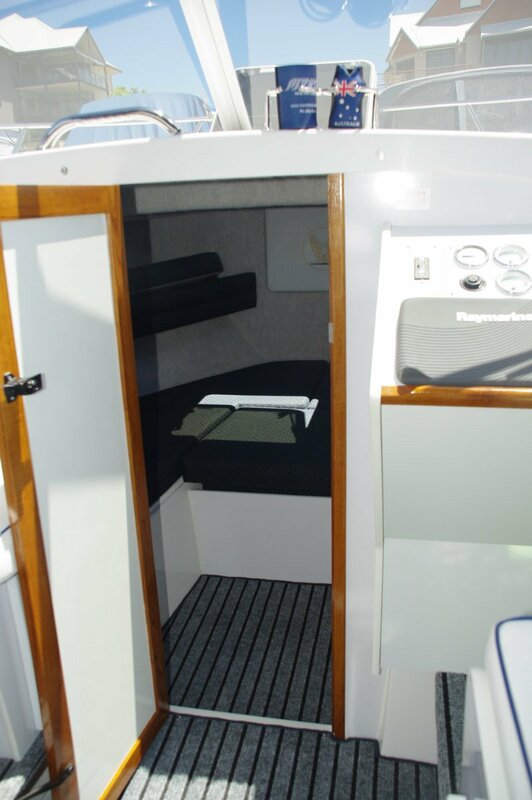 The galley has plenty of locker space, the fore cabin offers the usual under bunk stowage, and there are under deck compartments too.The more unusual volume, though, is in the side pockets. These are enormous, capable of absorbing everything from fenders to scuba gear, and they have the advantage of leaving their contents on view. That is a great asset: junk builds up when it is hidden. Although the 27 is a first class day cruiser, like all Caribbeans it is also a fine fishing boat. It has room, rail access and stability; there is so much of the last you could think the boat was aground. Much of the stability comes from the 3.2m beam, enough to support a flybridge variant and still have abundant stability. 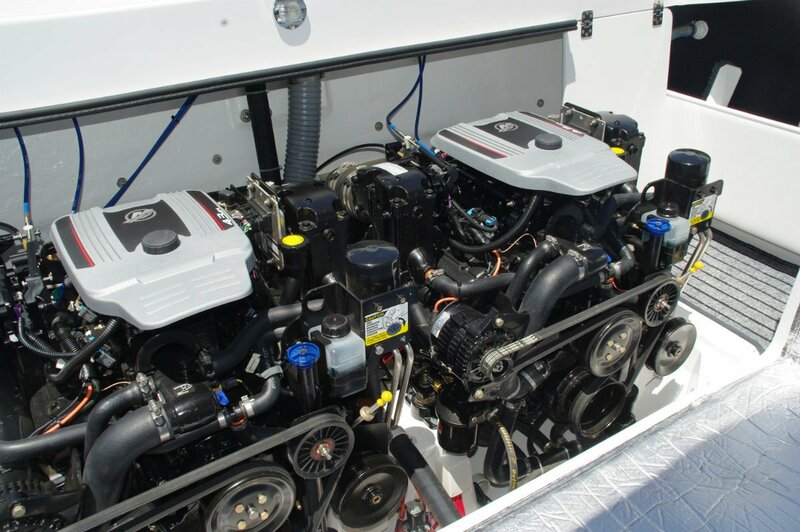 A pair of 4.3-litre Mercruisers (there is an option on a single diesel) with a combined 440hp gives a top speed of just over 40 knots. More importantly at 22-23 knots they are just lazing, and combined fuel consumption is between 35 and 40 litres an hour. A 550-litre tank gives a range of over 300 miles – a mighty day’s cruising. The motor box intrudes barely at all, just enough to provide the base for a three-seater settee. When this is swung forwards it reveals the best access to the motors a mechanic could hope for. As standard, the Mercruisers come with twin lever controls. People used to inboards usually prefer these, and those used to outboards vary in their preferences. The Caribbean agents installed single levers to suit this buyer. They also installed the Raymarine screen in the fascia instead of above the dash. Driving the 27 is all pleasure. Caribbean have been building and evolving boats for a long time, and they have got all the little things as well as the big things right. The driving position is excellent, the driver’s relationship with the controls is spot on, the seat has just the right resilience and behaviour is utterly predictable. Most 27s will spend most of their lives on the ocean, because practically all Caribbean owners are keen fishermen. 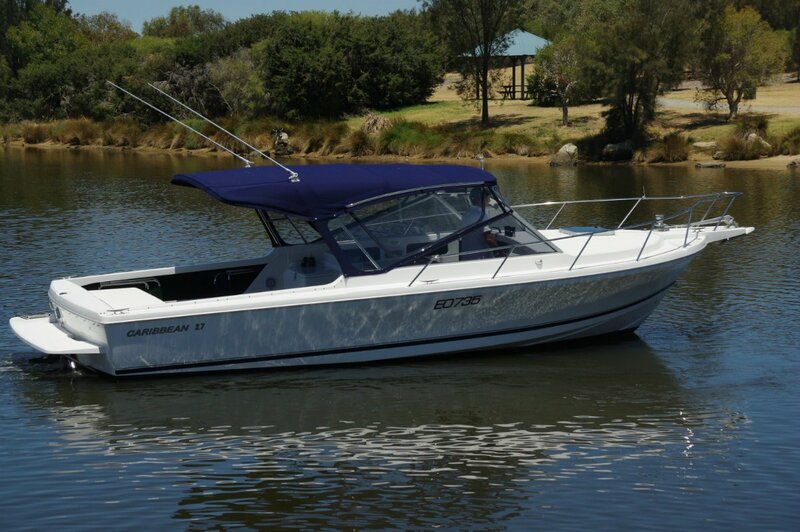 The runabout could be at home at Mandurah, cruising the inlet and rivers when not out at sea. The owner of the review boat operates out of Ascot Waters, so compulsorily spends time on the river – and has no complaints about it.